North, beyond the highest Himalayan peaks, is Upper Mustang. Long shrouded in mystery and closed to outsiders until 1992, the Kingdom of Mustang (the much-loved last king sadly died in December 2016 and at the time of writing his son remains uncertain as to whether to continue the role) is a high-altitude desert of multi-hued gorges, green oases, fairy-tale gompas, prayer flags and blood red fortified monasteries. This is a land so rich in traditional Tibetan Buddhist culture that it can often feel more classically Tibetan than the modern Chinese region of Tibet itself. It’s worth noting that Mustang doesn’t have the same awe-inspiring close-up views of the mountains as many of the other main Nepalese trek areas and that walking here is as much a cultural experience as a mountain one. With classical Tibetan Buddhist culture severely restricted in Tibet itself, Upper Mustang is now one of the best places to see it flourishing. But take note: Traditional life is changing here too, thanks to increased road construction and development. The walled capital of Upper Mustang, Lo Manthang, is a web of narrow white-washed streets and imposing monasteries and palaces. It’s one of the few remaining walled towns in the Himalayas and viewed from one of the surrounding hilltops, as the sun sinks low in the evening sky, it’s simply unforgettable. The sandstone cliffs, canyons and gorges of Upper Mustang are riddled with caves, many of which once housed monks, ascetics and entire communities. The former occupants of some of the caves left behind extraordinary frescos. Getting to many can be a real adventure and it’s likely that more remain to be discovered. Many of the fortress-like monasteries of Upper Mustang lie alongside former trans-Himalayan trade routes running from India to Tibet, and grew rich on this trade. Visit one of these monasteries today and you can see masterpieces of Tibetan Buddhist art and hundreds of glittering icons and statues. Nomadic culture clings on in Upper Mustang and you’re likely to pass some of the dark, felt hair nomad tents – but beware of the often ferocious Tibetan mastiff dogs standing guard. If you get the chance, pop in for a cup of salty yak butter Tibetan tea, and a chat about nomadic life. Although Upper Mustang doesn’t offer the high peak drama of many other Nepalese trekking regions, it does have gorges of glittering rainbow rock: Red, white, black, yellow and even blue, Upper Mustang is like the Grand Canyon with tins of paint thrown over it. The classic trekking route is straight up and down along the western, and more developed, side of the valley to Lo Manthang. Increasingly though, trekkers are making an epic loop up the west bank to Lo Manthang and then down the higher, wilder and far more remote eastern side. For those who really want to go off kilter though, Upper Mustang has a couple of highly adventurous routes including the crossing of the Teri La or, even more daunting Saribung La. Very rarely trekked, neither one is for normal trekkers; both require full expedition support and a willingness to blaze your own trail. It’s also possible to walk from Upper Mustang in to the Dolpo region by one of several routes, though all are extremely demanding and take three to four weeks. The spring festival of Tiji (or Tenche) is a three-day event in Lo Manthang during which masked dancers re-enact the battle between Dorje Jono, a Buddhist deity, and his nasty, demon father, to save Mustang from a terrible drought. Monks burn an effigy of the demon in order to rid the town of bad spirits and a huge tongdrol (a traditional Tibetan Buddhist painting) is unfurled from the palace walls. The festival normally takes place in May and the town gets very busy with trekking tour groups. Book accommodation in advance or be prepared to camp. The standard 10-day trek is straight up and down from Kagbeni to Lo Manthang (with an extra day or so you can start walking directly from the airstrip at Jomsom. For this part of the walk you don’t need the expensive restricted area permit of Upper Mustang). The standard route takes you up the western, more developed, side of the Kali Gandaki River and passes multi-coloured canyons and over wind-blasted passes (the highest is 4,325m). Each night you will stay in a small fortified village built around a monastery with accommodation in guesthouses rich in Tibetan atmosphere. It takes four days to walk from Kagbeni to Lo Manthang and the same for the return leg. This allows two full days in Lo Manthang, which is really the minimum required to explore the town and nearby monasteries and caves. Road construction along the western side of the Kali Gandaki is quickly bringing change to villages along this route. A more rewarding but longer trek is the 12-day Upper Mustang Loop. The first part of the trek to Lo Manthang follows the standard way up the western side of the Kali Gandaki. For the return though you follow a much wilder route down the eastern side of the Kali Gandaki. There’s much less development on this side of the river and no road construction. Villages tend to be more traditional and there are fewer fellow trekkers. The scenery is also more impressive than the western route, but the walking is tougher, fresh water harder to find, and villages more spaced out with some long days of walking. Vertigo sufferers should be aware that there are some terrifyingly steep and windy cliff faces to clamber up and down on this route. It’s worth building in an extra day to detour to the fabulous Luri Gompa, a hidden cave complex filled with Buddhist frescos and 14th century chortens or shrines. You can finish back in Kagbeni or in the major Hindu pilgrimage centre of Muktinath (on the Annapurna Circuit). Although there are comfy homestays in all villages along this route there’s one night when you will need camping and cooking equipment: The night halt is in a yak pasture with no facilities. This is only for the most adventurous and experienced hikers with full expedition support. The Teri La (5,595m) and Saribung La (5,600m) passes connect Upper Mustang with the valleys of Nar and Phu (see Annapurna). 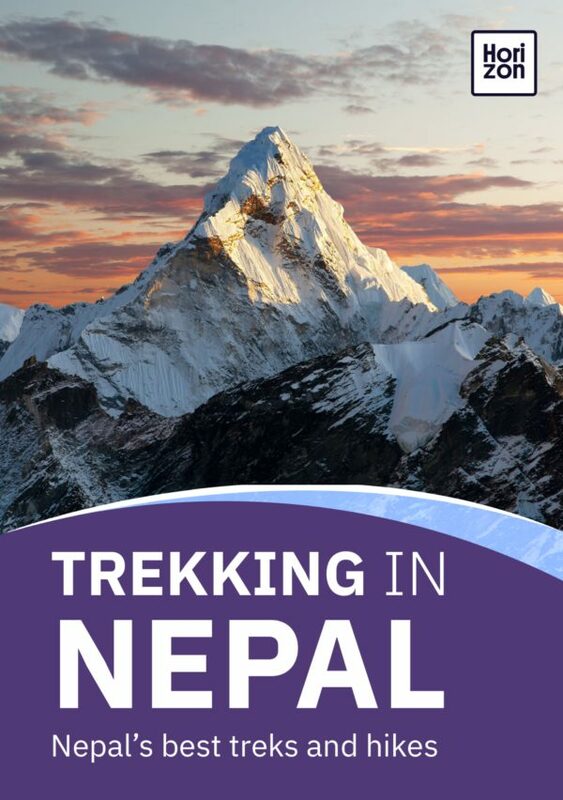 Each trek is around three weeks long and requires several nights camping well above 4,000m. Ropes, crampons and ice-axes are likely to be needed. Before committing to either of these very demanding treks ensure that your chosen trekking company has experience of these routes. Many claim to, but in reality very few do. Local guides are likely to be needed as well, but these can be very hard to find and even harder to convince to come along! TIMS permit required. Upper Mustang is a restricted area. A US $500 per person, 10-day permit is required. Additional days after day 10 are charged at US $50 per day. A minimum group size of two people is required and you must be on an organised trek. Unlike much of Nepal, Upper Mustang is totally within the Himalayan rain shadow and this means that the best time to trek is May to October, unlike most other parts of the country. While it’s not impossible to trek here in mid-winter you’ll find many passes snowed in, accommodation closed and many villages almost deserted as local people leave the area for lower, warmer parts of Nepal. Homestays are available in villages all along main trekking routes and they are often wonderfully atmospheric. Self-sufficient camping necessary elsewhere. Road construction is eating away at the standard route and changing life fast on the western bank of the river valley and in Lo Manthang.